Simple to use VoIP and the iPhone - hurrah! 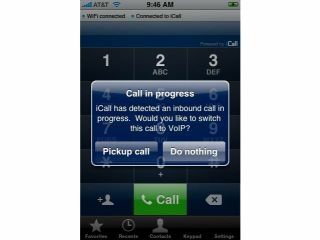 Voice over Internet Protocol (VoIP) provider iCall has launched an application for the iPhone that can rescue your precious calling credit by transferring your calls to WiFi for free or low-cost calls instead. Although only in beta version, the application allows the user to transfer the call through an automated response by iCall - cutting off the voice call and switching to WiFi. The problem with other VoIP packages for the iPhone is they have been too complex to set up and often need a network of friends to function. But the iCall seems simple to use, which is 75 per cent of the battle with these applications. VoIP - for all you who don’t know / care - is the packaging of the human voice spoken into a microphone and sent in itty-bitty little data packets over the internet, where another device unpackages them and spits them out through a speaker. As the internet is designed to do this already, it’s therefore free, and thus makes a lot of sense compared to paying separately for line rental and calling charges. Of course, not all VoIP is free, but it mostly works out cheaper than your standard call charges, especially when dialling internationally. It has traditionally had a stigma for forcing the user to sit tethered to their desk with a headset, which is never good in the world of mobile telephony. But the advent of WiFi enabled mobiles (such as the iPhone) means the technology can be properly utilised, although it’s taken a while for applications to be designed that do it in an easy and efficient way.